Nationalism has unexpectedly become a leading local and international force since the end of the Cold War. Long predicted to give way to pan-national or economic organizations, nationalism exerts its tremendous force on all continents and in a wide variety of ways. The Encyclopedia of Nationalism captures the aims and scope of this force through a wide-ranging examination of concepts, figures, movements, and events. 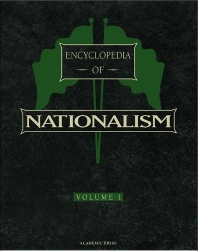 It is the only encyclopedic study of nationalism available today. University, research, and special libraries, societies, and organizations with collections/interest in history, political science, and the social sciences in general. Alexander J. Motyl is Deputy Director of the Center for Global Change and Governance as well as Associate Professor of Political Science at Rutgers University. The former Associate Director of the Harriman Institute, he has written about Ukranian, Soviet, and post-Soviet subjects for newspapers, magazines, and scholarly publications. He received his Ph.D. from Columbia University and regularly lectures to audiences worldwide. The author has absolutely no intention in passing a judgement on the only encyclopedic work on Nationalism available so far... As things go nowadays,, that would be utterly stupid and counter - productive. However, there are serious reasons to believe that a "derivative" of the said Encyclopedia - a Course Textbook focusing on the RECOGNITION OF NATIONALISM - as an ACTIVE PART of Human Behavior - followed by a Sanction - Manual for those who indulge too much in the "Mood" -might give a real aim and scope to Professor Motyl's ENCYCLOPEDIA. To cut the long story short - this Work of Reference should become the inspiration of further explanatory Textbooks meant to be the makeshift - tools of politicians and historians alike - in their struggle to explain Nationalism and contain its deviations. All with the single aim of avoiding the tragic misinterpretations of Nationalism during the last century - and to create a sane and human - friendly climate into the XXI - st Century, free of the toxic emanations that did cost our parents and grand - parents their lives and well- being... In other words, all upcoming "derivatives" of this great work of reference - The Encyclopedia - should be be provided with a surgical precision approach in treating NATIONALISM - wherever and whenever a political trend or doctrine will approach it and bring it to life... Hopefully - with the help of this exhaustive work - the global social and political scene will, eventually contain Nationalism to its philosophic definition - and will never put on the war-clothes again. Nationalism - I took it from my Mentor - is a Concept, - and not a Sword , a Flame-thrower or a Gas-chamber ! It is a tool to fit us together in strong Nations, working and fighting together, side by side, to overcome hardships - and not a lethal weapon of a Tribe against another, less fortunate Tribe... That's what I understood, folks !